Charlie Walker’s (University of Southampton) main research interests lie in the sociology of youth, work, and education, with a focus in eastern Europe and the former Soviet Union. He joined Southampton from the Russian and Eurasian Studies Centre at St Antony’s College, University of Oxford, where from 2007 he was CEELBAS Postdoctoral Research Fellow in Social Inequality in Russia and Eastern Europe. Prior to this, he received his PhD from the Centre for Russian and East European Studies at the European Research Institute, University of Birmingham. He continues to be affiliated to the Centre for East European Language-based Area Studies (a consortium of the Universities of Oxford, Birmingham and UCL), and is Honorary Research Associate at the School of Slavonic and Eastern European Studies, UCL. Martin Allen has taught in secondary, post-16 and higher education and was also a National Union of Teachers official for many years. His research interest is the relationship between education, employment and economy where he has published widely, including Lost Generation? New Strategies for youth and education (with Patrick Ainley Continuum 2010). Further details, including current work on apprenticeships can be found at www.radicaledbks.com. Pauline Leonard (University of Southampton) studied Sociology at the University of Reading before qualifying as a teacher at the Institute of Education, University of London. After teaching at further and higher educational levels in both the UK and Hong Kong, she came to the University of Southampton in 1990 to take a Masters (Education) and then progressed to study for a PhD (1991-5, ESRC funded). Her principle research interests are in diversity and work, with particular interests in gender and organisations, race and professional migration, and age and careers. Pauline is currently Head of Teaching Programmes in the Department of Sociology, Social Policy and Criminology which runs undergraduate and postgraduate programmes in Sociology and Criminology, combined with Social Policy and Anthropology. She is also Director of the University of Southampton’s ESRC Doctoral Training Centre. John Pratt (MCIOB, MCIPHE) started his career as an indentured apprentice in the construction and building services engineering sector. After completing his apprenticeship he ran his own small business for 11 years. In 1991, he entered the world of further education as a college lecturer. Over the last 15 years he has undertaken a number of management and consultancy roles in the further education and skills sectors including a period as a development manager for a sector skills council. He is a Chartered Construction Manager. His current post is Head of Eastleigh College Training Agency. Suzanne Reimer (University of Southampton) is Associate Professor in Human Geography. She has been a member of staff in Geography and Environment at the University of Southampton since 2004. Suzanne is a member of the International Advisory Board for Home Cultures since the journal’s inception in 2004. Julie Brown is a Lecturer in creative enterprise. Prior to this, she was a transformation fellow in cultural economy at the University of Leeds and a post-doctoral research fellow at the University of Birmingham, where she worked on a 4 year international research project looking at the locational factors of creative industries development across 13 European metropolitan regions. She has researched, published and taught on the role of creativity and the creative industries in urban and rural place-making and economic development; sites and spaces of contemporary cultural and creative production; conditions of contemporary creative and cultural work and labour; and cultural and creative sector policy development, and has been invited to lecture and chair workshop and symposia sessions on these topics both in the UK and abroad. Julie is currently undertaking research to understand how creative businesses in Southampton are evolving in response to global-local challenges and the role of local HEIs in supporting their development. She has just completed work for the British Council exploring the challenges and opportunities for developing the creative economy in Pakistan. Brian Hracs (University of Southampton) is a Lecturer in Human Geography. He joined Geography and Environment in September 2014. He is originally from Toronto and received his PhD in Geography from the University of Toronto. Prior to coming to Southampton he worked as a research fellow at the Department of Social and Economic Geography at Uppsala University in Sweden. He is interested in the iterative relationship between markets, technology and space. In particular, he focuses on key questions in economic geography related to entrepreneurship in the creative economy, the mobility of ‘talent’, the relationships between physical and virtual spaces, intermediation and the mechanisms through which distinction and value(s) are created and communicated. Paul Spencer is the Creative Industries Research and Support Officer at Eastleigh Borough Council where he works as part of the Creative Eastleigh team on the planning and delivery of initiatives to encourage growth in the local creative industries sector. Paul also carries out research into the effectiveness of local cultural and economic policy interventions, he oversees The West Wing Studios at The Point which provide affordable workspace for creative businesses, and he co-ordinates the Enliven Fashion Project which supports early career fashion designers. Paul is currently working towards his PhD in culture, economy and creative industries at the University of Winchester where he was awarded a scholarship from the Faculty of Arts. Paul is interested in the support infrastructure provided for start-up businesses in the UK creative industries sector via local initiatives and public sector interventions. His PhD research is focussed around longitudinal case studies of initiatives to support creative industries development in Hampshire. Paul has also recently established a new creative industries research network for the Solent sub-region which has been awarded funding from Creative Network South and has representation from the universities of Winchester, Southampton, Southampton Solent, Portsmouth and Kings College London. Rebekah Luff’s (University of Southampton) research interests include the provision of social care for older people, emotional labour and empathy, and sleep and ageing. Rebekah is a Senior Research Fellow with the ESRC National Centre for Research Methods (NCRM). She completed a BSc Psychology at Dundee University. She then undertook an MSc Research Methods in Psychology at the University of Surrey, followed by a joint psychology/sociology PhD looking at the emotion work of care staff working in care homes and how this related to the emotional support they provide for residents. Rebekah previously worked at the University of Surrey on the SomnIA: Sleep in Ageing project, a New Dynamics of Ageing-funded research programme examining poor sleep of older adults in care homes and in the community, before joined Social Sciences at Southampton in 2010. Shereen Hussein (King’s College London) is a Principal Research Fellow at King’s College London and a demographer with expertise in labour-migration and sociology. Her main research revolves around ageing, family dynamics, migration and long term care. Shereen’s current research focuses on ageing demographics, long term care demand and migration within the UK and Europe. Recent research projects include in-depth analysis of the participation of young adults in the English social care sector within the wider context of social care work organisation, recruitment and retention. Shereen is particularly interested in examining motivations, job satisfaction and work-life balance in emotionally taxing occupations including social care. Silke Roth (University of Southampton) is Associate Professor of Sociology in the Department of Sociology, Social Policy and Criminology. Her areas of research include the participation in and the impact of voluntary organisations, social movements and non-governmental organisations. Her publications include The Paradoxes of Aid Work. Passionate Professionals (Routledge 2015), Gender Politics in the Expanding European Union. Mobilization, Inclusion, Exclusion (Berghahn 2008) and Building Movement Bridges. The Coalition of Labor Union Women (Greenwood 2003), journal articles in Social Politics, Gender & Society, Third World Quarterly, Sociological Research Online and the Journal for Risk Research as well as numerous book chapters. Liz Norman is currently the Regional Manager for the Career Transition Partnership based at Tidworth, their largest resettlement centre. Liz has worked for Right Management, which is conjunction with the MOD forms the Career Transition Partnership, from the commencement of the contract in October 1998. She has been the Regional Manager since 2001 having previously worked at the Aldershot Resettlement Centre. Prior to working for CTP Liz headed up the Adult Careers Guidance provision in Herefordshire and before that worked for Gloucestershire Careers Service. Liz has two grown up children and three grandchildren and plays a very active part in the lovely village where she lives. 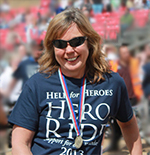 Susan Turnbull (Help for Heroes) has worked within the HR arena for over 30 year and is a Fellow of CIPD. She has worked for companies such as John Lewis, British Waterways, Virgin, Viacom and Carphone Warehouse, where she was Group HR Director. Susan ran her own HR consultancy practice for 13 years and was the CEO for Glotel PLC – a recruitment agency. She recently joined the Help for Heroes Recovery team as the Head of Career Recovery. Her team works with their customers to develop a purposeful life – which can be into paid, unpaid, voluntary or a passion driven career. At the heart of what they deliver is the Pathfinder Experience a range of services to help their customers realise their career goals.